Derbyshire closed on 44-5 in reply to Warwickshire's 391-9 declared after Day Two of their crucial LV= County Championship fixture at the County Ground, Shivnarine Chanderpaul (below) showing the only real resistance as he finished 24 unbeaten at close of play. Chris Woakes and Maurice Chambers shared the highest ever ninth-wicket stand for Warwickshire against Derbyshire to allow the visitors to declare shortly before the tea interval. The hosts, however, struggled to combat against the visitors' pace attack - before bad light stopped play with Wayne Madsen's side trailing by 347 runs with five wickets remaining. In search of early wickets, Derbyshire were met by a defiant record-breaking stand between Woakes and Chambers, who together helped Warwickshire post a formidable first-innings total. Persistent rain washed out the opening session - but when play finally resumed, the pair both struck career-best scores to add 166 runs for the ninth-wicket and allowed the visitors to declare on 391-9. England all-rounder Woakes was in sublime form striking 14 fours to end unbeaten on 152 off 273 balls. Partner Chambers, meanwhile, completed his maiden first-class half century, before he became the only Derbyshire victim of the day, stumped by Tom Poynton off David Wainwright for 58. The hosts had eight overs to navigate before tea, but Keith Barker (3-21) and Chambers (2-12) shared four wickets between them to leave Karl Krikken's men in trouble on 14-4. 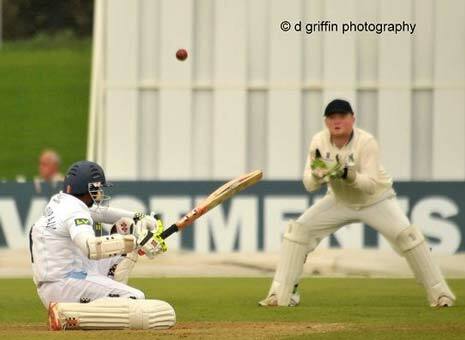 West Indies international Shivnarine Chanderpaul produced a stubborn resistance ending the day unbeaten on 24, but a fifth wicket fell before bad light stopped play with Derbyshire 44-5 and trailing Warwickshire by 347 runs. To view the full Scorecard from www.espncricinfo.com - CLICK HERE. Wayne Madsen led by example hitting a superb 97, as together with Peter Burgoyne, the pair helped kick-start the Derbyshire fightback on Day Two against Sussex at Hove. Derbyshire's T20 campaign is all but over, as they lost a vital encounter at the County Ground on Friday evening to Leicestershire Foxes. Yorkshire Bank 40, Group B. County Ground, Derby.